Something very important may be missing when your children go back to school this month. Several Florida districts are facing teacher shortages. Our I-Team has learned there are several factors leading to what could be the start of a serious teacher shortage here in the Sunshine State. “When I got a classroom of my own, it was important that the kids had an amazing library,” said Lisa Bejos, who fondly remembers her first day as a full-time kindergarten teacher. “I was so excited because it was a cute little school, loved the room. It had a ton of windows, which was important to me,” said Bejos. But she recently left teaching, because she said administrators tried to control everything. “I was told what to do and how to do it. After a while, it was like, 'I don't need a teacher's degree for this,'” Bejos said. “Everybody that's even close to retirement or has a chance to get out is jumping ship as quick as they can,” said Mike Gandolfo, who is President of the Pinellas County Classroom Teachers’ Association. He says an overemphasis on testing and outcomes is driving many qualified teachers out of the classroom. “That takes the joy of teaching out. When you take the joy of teaching out, then the kids lose the joy of learning,” Gandolfo said. 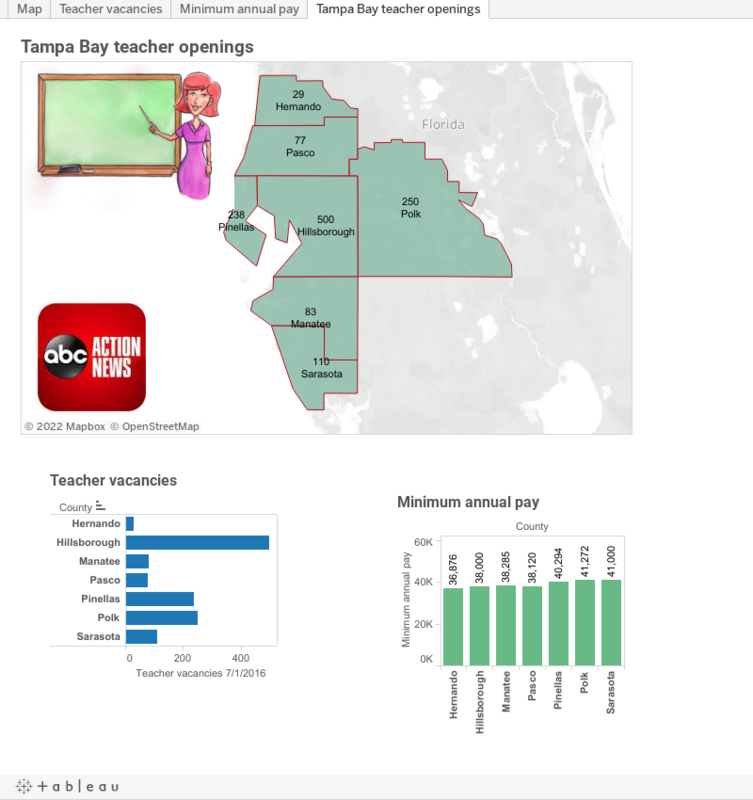 And that's one factor causing more teacher vacancies around Tampa Bay. "We've hired over 300 people so far this summer,” said Roy Sprinkle, who is the Human Resources Director at Sarasota County Schools. His job may be easier than his counterparts, because his district has an “A” rating and strong community support. “We have the highest average teacher salaries in the state of Florida,” Sprinkle said. But other districts are struggling. Sprinkle blames a larger-than-usual number of retirements, a shrinking pool of qualified candidates and a growing population in Florida. At latest count, about 110 teachers were still needed in Sarasota County. Hillsborough County had the most vacancies as of July 1, tallying around 500 openings. A total of more than 1,200 teachers are needed in seven Bay area counties before the start of school. Districts have been using creative methods to try to fill all those jobs. Hillsborough County Schools sent recruiters all the way to Puerto Rico, Pasco County Schools held its annual job fair five months earlier than normal in February, Hernando County Schools produced a YouTube recruitment video and Sarasota County Schools recruited at snow-covered campuses in the dead of winter. “Mainly, I focus on the Midwest, because this is where they vacation, so they know the area,” said Sprinkle. In Pinellas County, teachers can get up to $25,000 in incentive pay to work at low performing schools, which are currently under investigation by the U.S. Department of Education. But to get the full amount, they must have a master's degree, be at the top of the pay scale, work 90 extra minutes a day, plus some Saturdays -- and attend summer sessions. “There's an ambulance waiting for them at the end of the rainbow there, because it’s almost undoable,” Gandolfo said. Bejos misses teaching, but will put her skills to work through a charity she's starting called The Little Book Bus, which gives books to kids in economically challenged neighborhoods. “My life savings, I'm putting it into the bus. And you know what? It's a good cause. I have faith that the community will help support it,” she said. In the meantime, local districts are scrambling to get hundreds of new teachers in classrooms before the first bell rings. “What could be more rewarding than working with our children?” said Sprinkle. Click here for a look at where the jobs are located, along with starting pay, incentives and positions that are most in demand in each district.